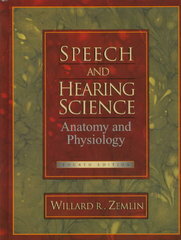 Speech and Hearing Science 4 Edition This comprehensive and highly-popular book is dedicated to the rehabilitation and habilation of the speech and hearing impaired. A solid foundation of anatomy and physiology are not the only things this book provides! also included are more advanced topics such as respiration, phonation, articulation, neurology, and hearing. This exceptional read is perfect for new speech-language pathologists, audiologists, deaf interpreters, physicians, ear, nose, and throat specialists, and others interested in speech and hearing disorders.